How are we different from our mortgage competitors? Who are our customers? What motivates us to provide this service? These are a few questions we have asked ourselves in an effort to bring focus to our growing organization in the form of a mission statement. We realize one thing great companies have in common is they live and breathe their mission statement. We are pleased to present Inlanta’s mission statement – a heartfelt expression of who we are, who we aim to be, why we do what we do and how we hope to be known. We understand that we all exist as part of something larger. The Inlanta culture is unique in the way our employees possess a mutual respect and genuine care for each other. 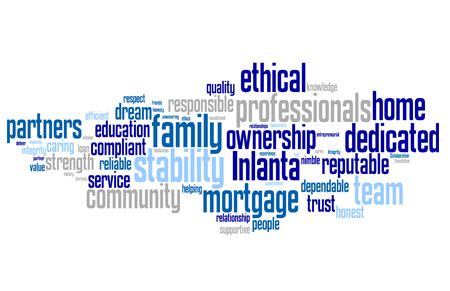 We work together to help people achieve their dreams of homeownership in a professional and efficient manner. We are dedicated to being a positive influence and aim to contribute to the greater good as friends, family and members of the communities we serve. We understand that we have the ability to impact everyone we touch and improve the lives of all those we serve, work with, as well as the communities we live in.